Hercules fence used a 12-foot high chain link fence for this project. Hercules Fence is happy to announce that it just completed a project for the National Zoo’s Smithsonian Biological Conservation Institute (SBCI). Located in Front Royal, Virginia, this environment was created to provide a safe place for the endangered bird species, the whooping crane. Unfortunately, there are less than 900 whooping cranes in existence today. The hope is that through this project, the whooping cranes will have an area to breed, which will create a self-sustaining population. Keep reading to discover more about this amazing project and how Hercules Fence was involved in this incredible project. Hercules Fence teamed up with Kee Construction from Winchester, Virginia to complete this $400k+ project over approximately eight weeks. They were able to construct five 50’ x 150’ rectangular enclosures. The enclosures were meant to keep the birds safe, as well as prevent them from escaping. The enclosures were divided into three pens of 50’ x 50’. There were also double gates throughout the space to allow the zookeepers to come through the area. In order to prevent young cranes from escaping the enclosure, hinges were used to prevent any large gaps. 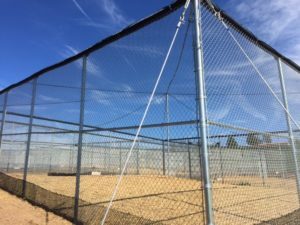 In terms of materials, Hercules fence used a 12-foot high chain link fence that also had a dig barrier at the base to prevent predators from coming in, as well as an overhead netting which prevents the birds from flying away. The giant net is supported by four steel cables that run from each of the corner posts. To make them as strong as possible, they are attached with eye bolts to a 16’ high center post in each pen. Also, a corrugated plastic pipe was also installed in an effort to protect the net. To stabilize the structure, we used an overhead bracing across the aisle ways. This was done by attached with ½” steel cables on the outside perimeter and affixed to helical screws that were embedded into the concrete. To prevent any intrusion, we also installed wire insulators on the outside of the fence. This entry was posted on Friday, January 11th, 2019 at 4:19 pm. Both comments and pings are currently closed.